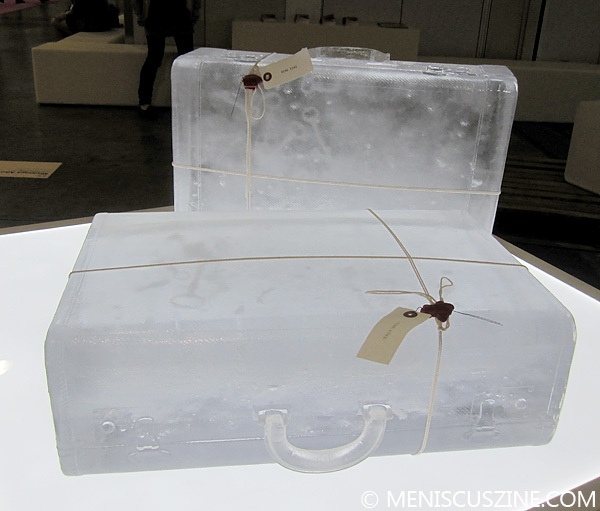 Tokyo-based Mizuma Art Gallery exhibited Aiko Miyanaga’s pieces in a prominent area of Art Basel Hong Kong 2014. According to the gallery, the Japanese artist’s work does not convey a complete preservation of an object, but exhibits its slow breakdown, much like “the physical and mental states of people” do over time. As such, Miyanaga’s unique sculpture art is meant to erode. 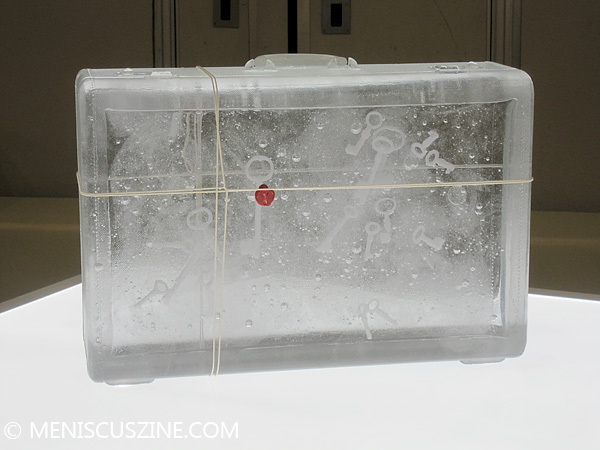 Miyanaga suspends a key in a suitcase and single shoes floating in limbo in their boxes, resembling ice sculptures. However, her work actually comprises naphthalene poured into molds. Naphthalene is comprised of crude oil, and according to the National Pesticide Information Center, can cause liver damage if humans are exposed to it. 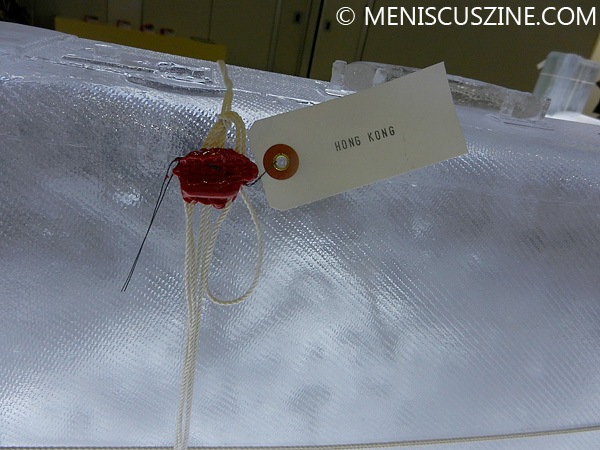 Assuming that this chemical is sealed away in Miyanaga’s sculptures, one can fully appreciate the glass-like surface sealing the mold in so that he or she can see the slow breakdown of the objects inside. That said, if the pieces exhibited were indeed “site-specifically produced” as suggested by the Mizuma Art Gallery handout and the attached “Hong Kong” luggage labels, then it would have been prudent to somehow install a video camera focusing on each of her pieces from the beginning of Art Basel Hong Kong on Wednesday through to its end on Sunday. It would have been fascinating to see how much of the original moldings were still intact and how subtle – or obvious – the changes were. One who does not have the pleasure of seeing her day-to-day work can assume that the breakdown of the napthalene molds is a slow, but subtle transformation. Or, like the finite duration of Art Basel Hong Kong, perhaps what Miyanaga is trying to convey is that all good things come to an end and to appreciate what is in front of you now because life is short. Unlike most precious objects, life cannot be contained or captured and preserved in a container. 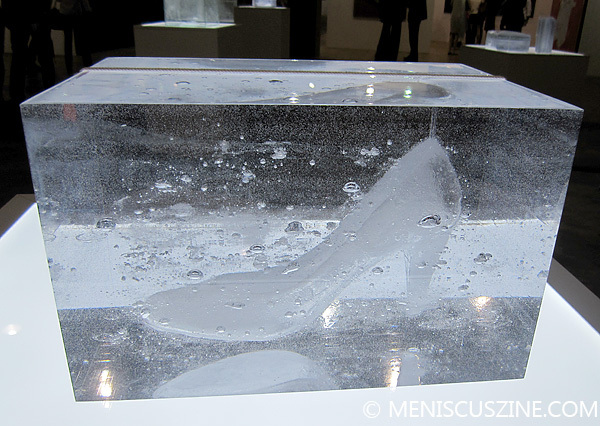 A work by Aiko Miyanaga, featuring a high heel.